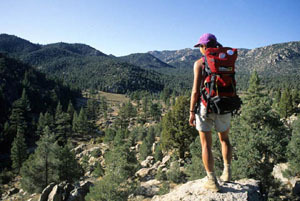 Library image #2037: A hiker enjoys the view of the South Fork Kern River, Sequoia National Forest. The United States Congress designated the Domeland Wilderness (map) in 1964 and it now has a total of 133,720 acres. All of this wilderness is located in California and is managed by the Bureau of Land Management and the Forest Service. Extremely rugged country with sparse vegetation, the original Domeland Wilderness was known for its many granite domes and unique geological formations. Additions were made in 1984, primarily on the north side, including a large basin surrounded by rock formations that comprises a gentler region with mixed conifers and wet meadows. The California Desert Protection Act of 1994 added land to the east (and a little to the south); thick pinion-covered mountains, rugged topography, perennial streams, and outstanding opportunities for solitude. Here in Domeland, semiarid mountains dwindle into low desertland. The Wild and Scenic South Fork of the Kern River, one of America's wildest waterways, crosses the Wilderness through deep gorges with bold rock outcroppings and domes interspersed with meadows. The river and its tributaries, which include Fish Creek, attract anglers in search of trout. Although the fishing can be excellent, you often will have to resort to strenuous off-trail hiking. The Pacific Crest Trail crosses the area north-south and follows the river for about nine miles. Other trails, suitable for foot and horse, give access mostly to the northern section, leaving the south and east seldom explored and difficult to travel. There are about 45 total trail miles. Planning to Visit the Domeland Wilderness? How to follow the seven standard Leave No Trace principles differs in different parts of the country (desert vs. Rocky Mountains). Click on any of the principles listed below to learn more about how they apply in the Domeland Wilderness.